The victory extended unbeaten Burgess Hill's winning streak to 11 games. "I don't feel we're that far behind them at all in terms of what we've got in personnel," Fallaize said. "In terms of game management we're still learning to be able to cope with teams who are well-organised. I haven't got a problem with losing, I will have a problem if we don't learn." The Green Lions have won just one of their last five matches in the Isthmian League Division One South and have slipped to ninth in the table, with all but one of the sides above them having games in hand. 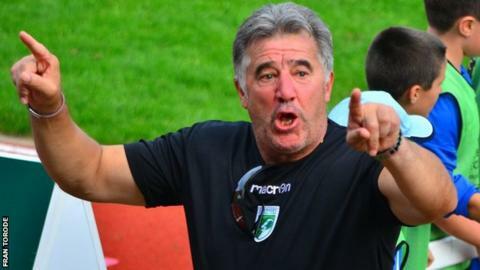 Guernsey are in their fourth season of football in England and only the second in the Isthmian League. "There was a lot of football and a lot of experience in that side, (they have) played consistently at that level over a number of years," Fallaize told BBC Radio Guernsey. "When you play at that level, and levels above, you become a better player. "We're climbing up into that area, and let's not forget that where we are now is a little sticking point in the learning, but it doesn't mean we haven't got the potential to learn more."